All previously unpublished material by Marianne Moore is published here by permission of Clive E. Driver Literary Executor of the Estate of Marianne C. Moore. Subscription: Two issues a year, Spring and Fall U.S.A $4.00 a year; Foreign $4.50. Subscriptions run for calendar year in which placed. Continuing subscriptions available. Please make cheques payable to MMN, The Rosenbach Foundation. Contributions welcome on all aspects of MM and her work up to 75O words. Deadlines: Spring, February 1st; Fall, October 1st. The history of "No Swan So Fine" has emerged from an exploration in the MM Archive; the assembled references offer an enriched reading of the poem. The loss of your friend, Lord Balfour, must be a great one to you; for even we who knew him only as a personage, will remember his death with lasting regret. In his relations with America he was so exceedingly kind, chivalrous, and hopeful. But I myself knowing less than I ought to know about government, found it pleasant to know that Lord Balfour played a good game of tennis. In the summer of 1930, MM noticed a Christie's sale announcement in the Illustrated London News (28 June, p. 1211). In her notebook, she sketched one of a pair of Louis XV candelabra, "the property of the late Lord Balfour," pictured in the advertisement. A year later, MM read in the New York Times Magazine (19 May 1913, pp. 8-9) an article by Percy Philip, "Versailles Reborn: A Moonlight Drama." This piece was prompted by the restoration of Versailles then taking place with the aid of the Rockefeller Foundation. Philip wrote his "drama" in a fanciful vein, pretending that the statues on the grounds protested the dullness of Versailles without the court of the Kings Louis. Now, he says, Melancholy is queen of all the shades, and "it is she whose stillness rests like a gray cloud over the gardens and the water in the fountains of Versailles." MM clipped one of the accompanying pictures and wrote above it the caption from another which showed the defunct fountains, "There is no water so still as the dead fountains of Versailles,"
flowers,--at ease and tall. The king is dead. Lord Balfour had a pair o' these candalabra which were sold last year at Christie’s with his other things. Each swan has a gold saw-toothed collar and chain and both feet are planted on the tree. Next to the quotation in the first two lines, MM added the name "Percy Philip" to acknowledge her source. Except for the change of spelling to "candelabrum" and the deletion of commas after "sea-urchins" and "flowers," Poetry printed the poem in this version (41, October, 1932, 7). The exchange of "ambidextrous" for "gondoliering" in line four was made in March, 1933, for Ezra Pound's printing of the poem in his Active Anthology. In that printing, "candalabrum" was spelled as in MM's letter, and a comma was restored after "sea-urchins." 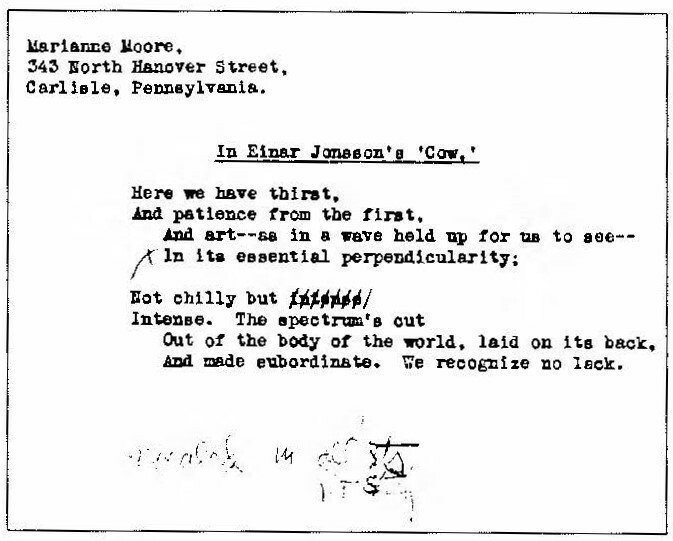 MM included this poem in three subsequent collections making only minor changes in punctuation. It is one of the few poems to resist MM's later textual revisions. fountains and the dead king of the poem, while the swan candelabrum remains as an elegant artifact, representing the permanence of a work of art and its ability to outlast its progenitor and its custodian. "IN THE MUSEUM AT WHITEHALL"
"Why, oh why, one ventures to ask, set / flatness on some cindery pinnacle / as if on Lord Nelson's revolving diamond rosette?" asked MM in "Tell Me, Tell Me." "What, oh what," one might ask, "is Lord Nelson's revolving diamond rosette?" MM’s note to the poem identifies it only as "In the museum at Whitehall," a London landmark which has now no museum. The warden showed us a peg from which an ornament (a diamond aigrette) was missing. He looked very significant and said Mrs. So and So (Lord Nelson’s descendant who had lent it) had taken it out as she was attending court functions and so on. He said the Sultan of Turkey had presented it to Nelson; that it had a "vibratin' plume and a revolvin' rosette of diamonds;" you could wind the rosette and it would revolve slowly for some time. "Chelengk" a diamond "Plume of Triumph" presented to Nelson by the Sultan of the Ottoman Empire (Selim III) after the Battle of the Nile (August 1, 1798). It consisted of a revolving rosette with a true-love-knot beneath and thirteen rays above [symbolizing thirteen French ships sunk by Nelson’s fleet], all in diamonds. It was intended as an ornament to be worn in the hat, and was in the nineteenth century, when it was owned by the Bridport family, worn at Court as a hair ornament by ladies of the family. as if on Lord Nelson's revolving diamond rosette? Her description of the gem does credit to it and to the proud Nelson whose portrait in the National Maritime Museum shows him wearing the "burnished rarity" in his tricorne hat. 1The Complete Poems of Marianne Moore. New York: Viking, 1967. p. 231. When she had the opportunity to choose poems for her first major book, Observations (1924), MM included a handful of unpublished ones, but not necessarily new ones. "An Egyptian Pulled Glass Bottle in the Shape of a Fish" depended for all but its title and last two lines on a poem written in 1915. His creations are of so uncommon a character, so entirely the product of his individuality, that the critic who loves to find a classified place for every artist is nonplussed. Evidently Einar Jonsson does not belong to any school.... In his art [he] is never the slave of dogmas, and he follows them only if they happen to harmonize with his instincts. The old masters have not taught him anything, only, perhaps, this, that he, like themselves, will pursue his own way and build from his own ground. Among the works pictured is "The Wave of the Ages," the "wave held up for us to see / In its essential perpendicularity". are impossible, and there ought not to exist forerunners or followers in art. For it should come from within, and not entirely from without. It should be an expression of the personality itself. This statement is followed by pictures of four sculptures including "Ymir and Audhumla." The caption notes that "the giant Ymir, according to the Edda story, suckles the cow Audhumla;" they represent the nebula and ether, the first things created. Here, of course, are the elements of the title, the lines "Here we have thirst,/ And patience from the first," as well as the conclusion of the 1915 version. MM submitted the poem to the American-Scandinavian Review in May, 1915. It was rejected. "A Fish-shaped Glass Bottle from Tell el-Amarna." Six years later, the Egyptian bottle made its appearance in "Home Life in Ancient Egypt 3000 Years Ago" by T. Eric Feet (Illustrated London News, 159 [6 August 1921], 182- 185), A dig had unearthed a "unique" bottle called "the gem of the collection: the finest example of ancient Egyptian art from Tell el-Amarna - a fish-shaped glass bottle." A black-and-white picture of the "multicolored” bottle accompanied the article. With this bottle for inspiration, MM reworked the poem, effectively burying the sources of her "thirst" and "wave" images, for the bottle by itself can seem to account for them. MM must have felt satisfied with this version, at least until Complete Poems (1967) when she changed "with" in the last line to "by." MM’S interest in the work of Anthony Trollope prompted two Dial pieces and quotations in both "Marriage” and "An Octopus" all published between 1923 and 1927. In 1933, she found an outlet for a renewed interest and she published in the Criterion a review of a special edition of The Warden. Signed "M.M", it has not come to the attention of indexers or bibliographers, but it is so characteristic of MM's literary concerns as to merit attention. In the fall of 1932, MM read that the Pratt Institute, Brooklyn, had brought out a model edition of The Warden. It was part of a non-profit venture intended to provide library editions which would withstand hard use. As Dr. Edward F. Stevens, project organizer, told the New York Times on 14 November, he had planned "a redemptive effort toward the rescue of standard literature from the humiliation of ephemeral reprints for the casual reader or of showy sets for the gullible buyer, none of which has any place on the shelves of a library...."
MM then wrote a 922-word review of this edition which combined two of her enthusiasms: Trollope and superior book production. On 23 January 1933, she sent it unbidden to the Criterion, although she realized that "review space should as a rule be used for new books...." It appeared among the "Shorter Notices" in July (Vol. 12, pp. 111-112). The review notes in its opening paragraph that this edition commemorates the fiftieth anniversary of Trollope’s death, appears with his family’s permission, and serves as a fitting remedy to the harassment by American piracy which plagued the author's work during his lifetime. The book is printed on fairly heavy light-ivory laid paper, in 12-point Linotype Granj on, It has been suggested that the title-page is too expanded and that the twig-and-apple between line 2 and line 3 could be spared since an engraved fruit-in-basket with garden implements occupies the middle of the page. Both faults, however, if they are faults, are the result of over-anxiety for perfection; and independent of scale, the herring-bone weave of the straw basket and its tastefulness seem just the right device for Trollope. In the matter of margins, one is easily unreasonable; Gordon Craig and Whistler having made timber-woIves of many who would otherwise be harmless dogs. The Book Collector's Packet would have preferred a coloured binding, but about the black buckram one is very sure. The black horse, the black panther, the black squirrel, the French woman, the English man, look well in black, and the separate volume preserves distinction by a stiff binding that is black; or if paper-bound, by white. Nor does one concede that there should be a great disparity between the book for use and the noble book. Collectors should spurn exaggerated dimensions, hasty signatures made wholesale, and noisy materials. The question, could this book have been made so that a Medici would like it better ought rather to be, why do those who can have what they like, accept distinction that is without handiness and modesty? This apparently unremarkable specimen of The Warden is a symbol of "judgment and exact taste in the book arts." It catches the eye and one studies it a moment to see what makes it vivid, unaffected, and at home in its clothes. The book itself, which MM kept in her library, is indeed a worthy book in fine clothes. Moreover, it has its place in the history of book production as an early example of a sturdy, well designed book meant for library use. It is a great improvement over the "ephemeral reprints" and "showy sets" which MM must have suffered in her Hudson Park Library days. contemporary critical method, to enact the content of the essay in her style. In its published form the essay begins abruptly by asserting that "For the most part in what we read, it is the meaning rather than the tone of voice which gives us pleasure. "3 What is unsettling is that immediately after this MM argues cogently, but inexplicably, considering her opening, for the importance of an author's tone of voice. Defining tone of voice as "that intonation in which the accents responsible for it are so unequivocal as to persist no matter under what circumstances the syllables are read or by whom they are read," MM claims that by it an author compels or repels us.4 She then guides us through a remarkably complex set of assertions and examples designed to prove her point. To paraphrase MM's illustrations: Poe’s voice, flavored with artifice whether he writes history or fiction, is successful in the tales since it intensifies the artificiality of his drawingroom conversations; but in his essays on the Literati of New York where the ideas are not sound and where he lacks imagination, that same tone works against him becoming a "straining for rarity and an unmistakable tone of condescension." Venus pencils are made in seventeen black and two copying degrees, each degree guaranteed never to vary: softest and blackest, very very soft and very black, very soft and very black, very soft and black, soft and black, soft, soft medium, firm, medium hard, hard, very hard, extra hard, very very hard and firm, extra extra hard and firm, extra extra hard and extra firm, hardest and firmest. MM's first sentence is cogent and remarkably prophetic in its criticism of imagism carried to the extreme, but her argument is not altogether convincing. The Venus pencil advertisement, a curious choice for an exhibit in a critical argument, undoubtedly has accents "so unequivocal as to persist," but it also has meaning. These are not nonsense words, and to MM, a talented sketcher herself, the words must have had very specific meaning. What MM claims is that it might not continue to give her pleasure and thus "is not worth much." But it is difficult to accept this evaluation and even more difficult to justify MM's abrupt return to her opening remark. "A cognate essay is on Description in Poetry by Mr. A. Clutton-Brock, who contends, firstly, that beauty in poetic description is irrelevant unless it adds to the cumulative powers of the whole, and secondly, that it must be judged by absolute standards but by its relation to the theme. Sound notions, these. The first might be taken to heart by certain modern bards; the second, by their critics." Books of the Month: ENGLISH REVIEW, January, 1912. "Does Mr. Shaw admit that he has blundered? Not a bit of it. He assures the spectators that while in one sense the theme is not the 'opening theme’ because it does not open the work, in a higher, subtler sense it is the opening theme inasmuch as the music passes into it by 'an irresistible gravitation.' Mr. Shaw's week I suppose, begins with Tuesday afternoon." "The Arts and Crafts of Bernard Shaw." Reprinted in the TRANSCRIPT, Boston, September 16, 1914.
and the English of the footnote to one of Augier’s plays: "Three chops well peppered." The quotations all capture a distinctive tone of voice and thereby provide pleasure. The Butler passage, from his then recently published Notebooks, also supplies the necessary comparison with Poe's critical prose and suggests a criterion MM employed in her own writing: "...if I think something that I know and greatly like...no matter whose it is, is appropriate, I appropriate it." What we also discover is that MM appropriated these quotations and the Venus pencil advertisement just because they enabled her to argue dialectically for the simultaneous importance of meaning and tone of voice. Furthermore, in arguing for the importance of capturing tone of voice she isolated the shortcomings of imagism and anticipated contemporary poetic concerns, particularly those of Williams in his later work and of Charles Olson and Robert Bly who sought to capture in poems and on paper "that intonation in which the accents which are responsible for it are so unequivocal as to persist no matter under what circumstances the syllables are read or by whom they are read." Finally, and here the discovery of the unpublished section of the essay is most important, she anticipated by assembling her own bouquet of vocal exclamation points the method of some contemporary critics who attempt in their prose to mime the content of their essays. 1 MM, "Samuel Butler,"Chimaera, l(July 1916), 55-56. 2 Typescript, Rosenbach Foundation. Since MM did not note the deletion in her own copy of the MS, as was her usual practice, the cut was presumably made by Harriet Shaw Weaver at The Egoist. 3 MM, "The Accented Syllable," The Egoist, 3(October 1916), 151-152. 4 Justin Replogle, in an excellent study of MM's use of intonation ["Marianne Moore and the Art of Intonation," Contemporary Literature, 12(Winter 1971), 1-17] raises the question of the importance of meaning to intonation but seems not to have read MM on the same subject. The Marianne Moore Collection at the Humanities Research Center contains many items of interest to scholars, collectors, and admirers of MM’s work. The collection can be divided into several categories 1} her manuscript works and correspondence; 2) association copies of her books; 3) limited, first, and subsequent editions of her books; 4) books and serials from her own library; 5) ephemera; 6) artistic works. Although this particular variant was never printed, MM has the following note beside it: "(what I had first and I think it is better, smoother)." The HRC holds the complete original typescript of MM’s only play, The Absentee (1962). Drafts, in some cases multiple, are held of the article "My Crow Pluto, the True Plato," and of the following poems: "An Expedient - Leonardo da Vinci's," "A Face," "The Fish," "Jamestown," "Rescue with Yul Brynner" (with her copy of the CBS television script of the same title), "A Talisman," and "To Victor Hugo of My Crow Pluto." The most important of the typescripts of her critical articles and essays are "The Cantos," on Ezra Pound, and her review "Kora in Hell by William Carlos Williams." The final items that should be mentioned in conjunction with her MS works are the corrected galley proofs of Selected Poems (London, 1935). It is interesting to note that the corrections are entirely in MM's hand, even the galleys to the introduction by T. S. Eliot. A description of the remaining items in the Marianne Moore Collection at the HRC will appear in subsequent issues of MMN. 4 to Rolfe Humpheries, 1957; 2 to Morrill Cody, 1959; and 17 to Dr. Jack W. C. Hagstrom. The letters to Miss Bogan contain comments about her reviews of MM’s books and MM's interests in Louise Bogan's work. Can anyone tell us where to find the archive of the Dial Press (1920’s)? Mr. Donald Gallup reports that it is not at Yale where the Dial magazine archive is housed. MM’s Observations was published by the Dial Press, then located in the same building as the magazine and headed by Lincoln MacVeigh. MM quoted passages from The Saints’ Everlasting Rest by Richard Baxter, Lippincott, 1909, according to her notes. However, that edition does not contain some of the passages she quoted. Does anyone know whether the book was used as a textbook at Yale, 1904-1908? If so, MM might have been reading a copy that belonged to her brother, a Yale student during those years. In "Nine Nectarines" MM speaks of a "much-mended plate" painted with nine nectarines "in twos." Is the plate perhaps part of a museum collection in New York where MM might have seen it on display? Can anyone account for the "medieval decorated hat-box" in "When I Buy Pictures?" Why, in "Camellia Sabina," should Tom Thumb "the cavalry cadet" ride an "Italian upland meadow mouse?" Borroff, Marie. 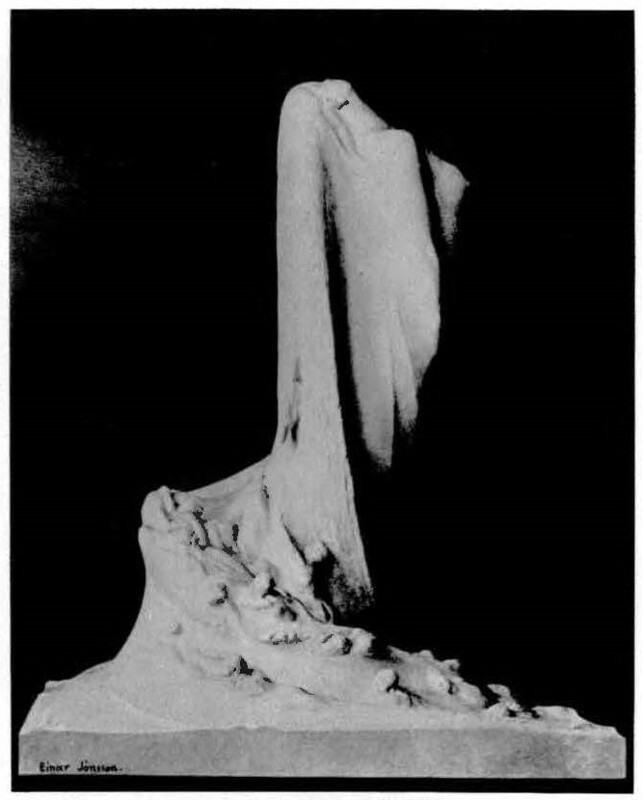 "Dramatic Structure in the Poetry of Marianne Moore," Poetica: An International Journal (Tokyo), 1(1974), 72-83. "Decorum marked life on Clinton Hill in the autumn of 1929 when my mother and I came to Brooklyn to live," MM says in her essay, "Brooklyn from Clinton Hill.” Dr. George Litch Knight, pastor of the Lafayette Avenue Presbyterian Church and MM's friend of many years, kindly told us that the current name of the area is Fort Greene Park (not Brooklyn Heights as our last issue stated). The park pictured above was formerly known as Washington Park and called so by MM. Norman Wiltsie reports that the crosswise street in the picture is Washington Park (the name given the extension of Cumberland beyond DeKalb) at the corner of Willoughby Avenue. MM's famous 260 Cumberland Street address lies within walking distance of both the church and the park. A proposal for a special session on "Marianne Moore: Early Ideas and Images" has been presented to MLA and announced in the Spring MLA Newsletter. Decision on acceptance will be made in May. Inquiries about papers and panelists can be addressed to the editor of MMN. An exhibition entitled "Images of Marianne" is planned for the winter of 78-79 at the Rosenbach Foundation in Philadelphia. It will include paintings, sculpture, drawings, portrait photographs, and other pictures of MM. The Rosenbach Foundation will be pleased to hear from readers of MMN about pictorial material concerning MM. Our first MMN (Spring, 1977) described the Marianne Moore Collection at the Rosenbach Foundation, 2010 De Lancey Place, Philadelphia. It is from this Collection that the "Observations" in MMN are drawn. MM’s livingroom is there, and her entire archive is open to scholars by appointment on weekdays, 9-5. Other visitors are welcome to see the MM room Tuesdays through Sundays, 2-5. The Rosenbach Foundation is closed during the month of August. We ask our readers to use printed page or word of mouth to tell other MM aficionados about the Marianne Moore Newsletter. Complimentary copies available upon request: MMN, 2010 DeLancev Pl., Philadelphia, PA 19103.